Diagnosis is an art and science, which results from the synthesis of scientific knowledge and clinical experiences in identifying the signs and symptoms of a disease process. Dental caries is a complex disease, defined as the process of progressive demineralization of inorganic component of the tooth accompanied by disintegration of the organic portion. It is a dynamic disease process, in which early lesions undergo many demineralization and remineralization cycles before being expressed clinically. Therefore, recognition of the initiation and early detection of caries should be the primary concern rather than the search for cavities. Need for accurate diagnosis before cavitation would permit targeted preventive treatment such as fluorides and pit and fissure sealants, thereby significantly improving dental health and reducing the need for extensive drilling and filling. Modern dentistry emphasizes more on prevention, and hence the original maxim of "extension for prevention" has been eschewed for a minimal intervention approach. Tools to assess future caries risk and present caries activity are required, as diagnostic tasks are becoming more difficult and important from the standpoint of long-term oral health. Determine present caries activity and monitor lesions behavior over time. The following are methods of advanced caries detection [Table 1]. Indirect - For example, video camera is used for forming digital images of a radiograph. Photo Stimulable Phosphor plate (PSP). They are not practically used because they are very time-consuming. It is not yet routinely applied in clinical caries detection due to difficulty of image registration. This method constructs radiographic section through teeth. The slices can be viewed for the presence of radiolucency [Figure 4]. As exposure begins, the tube and film move in opposite directions simultaneously through a mechanical linkage. With this synchronous movement, images of objects in the focal plane remain in fixed positions on radiographic film and are clearly imaged. 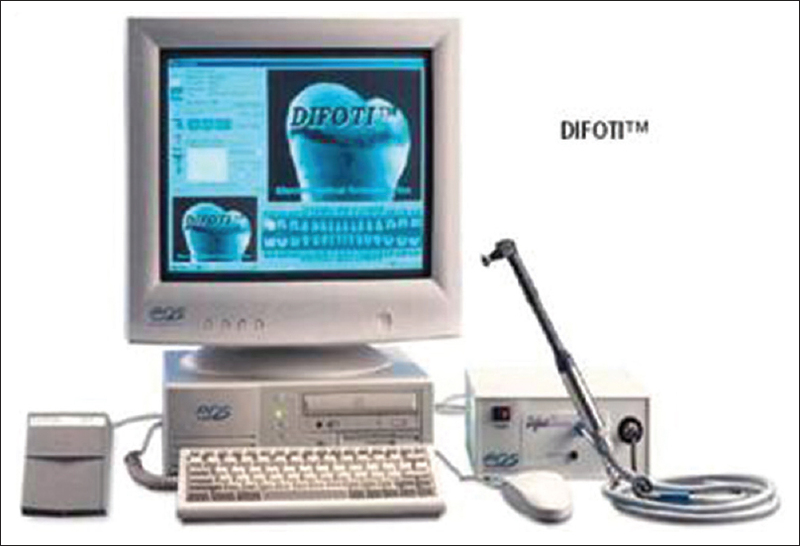 Digital imaging fiber-optic transillumination (DIFOTI) was developed in an attempt to reduce the perceived shortcomings of FOTI, by combining FOTI with a digital CCD camera. DIFOTI has elevated traditional transillumination to more sophisticated diagnostic levels [Figure 6]. It uses a safe white light with which images taken from all the tooth surfaces can be digitally captured using a digital CCD and sent to a computer for analysis. Receptor with photocells converts photon energy to electrical energy - transmitted to a video processor and converted into color value and displayed on video monitor. The use of fluorescence for the detection of caries dates back to 1929 first described by Benedict. Fluorescence results from change in the characteristics of light caused by a change in wavelength of incident light rays following reflection from the surface of material. QLF is based on the principle of fluorescence. It enhances early detection of carious lesions, particularly progression or regression of white spots of smooth surface lesions. It provides a fluorescent image of a tooth surface within yellow-green spectrum of visible light that quantifies mineral loss and size of the lesion [Figure 7]. 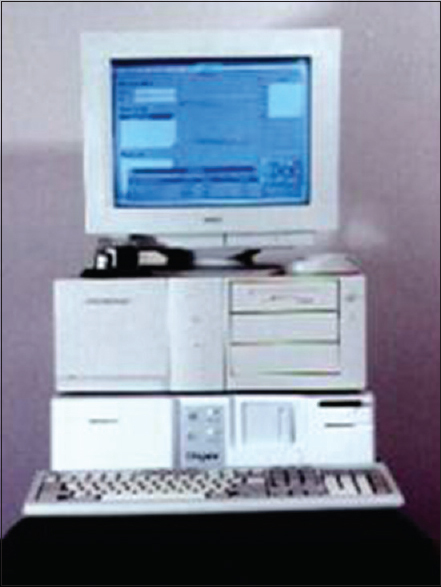 System includes a measurement probe, control unit, and computer fitted with a frame grabber. The control unit consists of an illumination device and imaging electronics. Light source is a special arc lamp based on xenon technology. The light from this lamp is filtered by a blue-transmitting filter. A liquid light guide transports blue light to the teeth. Recording of florescent image is done with a yellow transmitting filter positioned in front of the color CCD sensor. Image is then digitized by the frame grabber and is available for quantitative analysis. Tooth is seen on a computer monitor as fluorescent green and dark areas indicate mineral loss or white spot lesions. Image can be saved and compared over time to track demineralization or remineralization [Figure 8]. DIAGNOdent was first introduced in 1998 to aid the diagnosis of occlusal caries in adjunct to visual and radiographic examination. 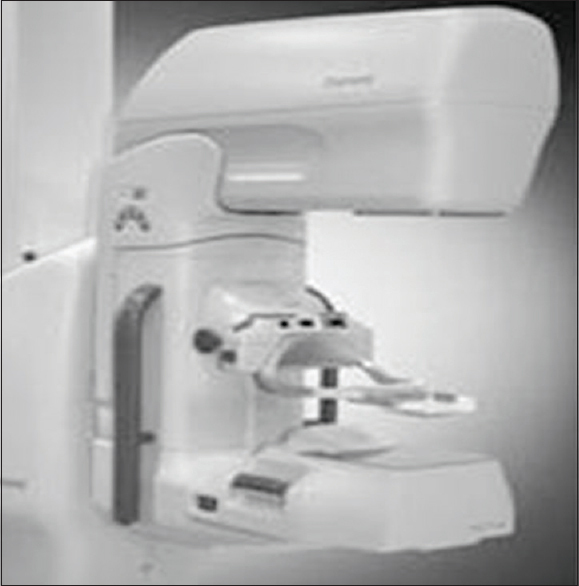 It is a variant of QLF system and was introduced based on research by Hibst and Gal. 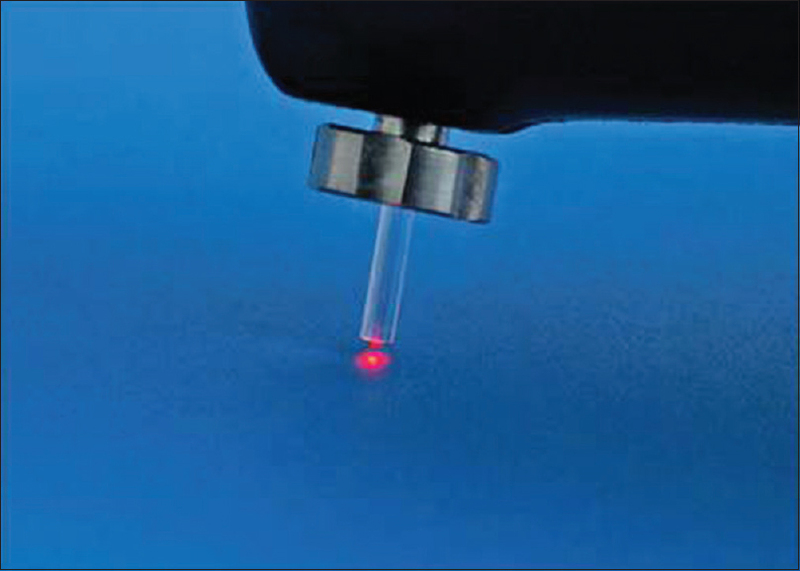 DIAGNOdent technology uses a simple laser diode to compare the reflection wavelength against a well-known healthy baseline to uncover decay. The unit has a fiber-optic cable that transmits light source to a handpiece that contains a fiber-optic eye in the tip. 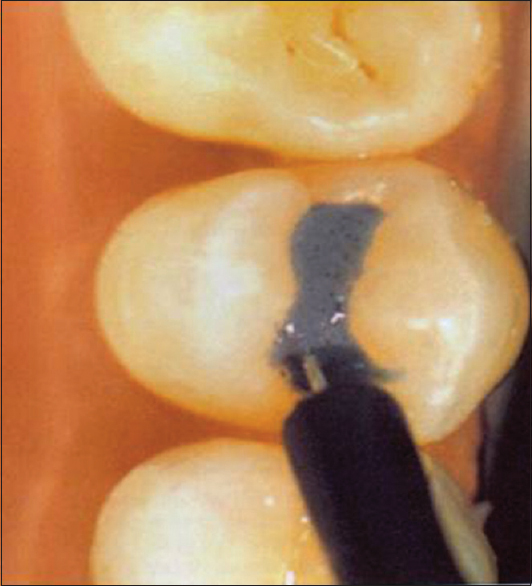 First, the laser diode is aimed at the healthy enamel tooth structure to obtain a benchmark reading. After calibration, it is moved to inspect all the surfaces of the teeth, shining the laser at 2.5 mm into all suspected areas. As the laser pulses into grooves, fissures, and cracks, it reflects fluorescent light with particular wavelength. This is because light is absorbed by the organic and inorganic components of the tooth which induce infrared fluorescence. Electrochemical machining (ECM) is based on the principle that a demineralized tooth has more pores filled with water or saliva, and this is more conductive than intact tooth surface. This technique has two methods of application. Applies probe as electrode into fissures and the electrical conductance of that site is measured. To prevent current from leaking through superficial layer of moisture through the gingival, airflow is applied to dry the tooth surface around the probe. Disadvantage is that only small areas of occlusal surface can be measured at one time [Figure 12]. Two instruments based on the difference in electrical conductance of carious and sound enamel were developed. It used a current of 25 Hz. Measured conductance was then converted to an ordinary scale of 0-9. Moisture and saliva were removed by a continuous stream of air to prevent surface conductance. It used a current of 400 Hz. Measured conductance was then converted to four colored lights. This method requires pits and fissures to be moistened with saline. Use of ultrasound to detect dental caries has been proposed for the past 30 years, but the technique has received renewed interest particularly in the past 10 years. It was introduced for detecting early carious lesions on smooth surfaces. Ultrasound makes the use of sound waves with frequency. They are longitudinal or pressure waves which travel through gasses, liquids, and solids. Ultrasound interacts differently with different tissues. They have a frequency of >20,000 Hz and have all the properties of waves, in that they may be reflected, scattered, refracted, or absorbed. The relative ability of a medium to reflect sound depends on its mechanical properties such as elasticity, density, and wavelength of sound. Amount of sound reflected provides information about the structure of reflecting interface, whereas the time taken for sound to be reflected provides information about the position of the reflecting interface. Sound waves produced as a result of minute changes in crystal dimension may be omitted continually, as burst of waves or as a single pulse. For sound waves to reach the tooth, they have to travel through a coupling medium or an agent which has acoustic impedance. Various acoustic coupling agents have been used such as mercury, aluminum rods, water, and glycerin. An ultrasonic probe is used which sends and receives longitudinal waves to and from the surface of the tooth. Initial white spot lesions produce no or weak surface echoes, whereas sites with visible cavitation produce echoes with substantially higher amplitude. This method if improved can be a realistic alternative to radiographic diagnosis of caries on approximal surfaces. It is also more sensitive than visual-tactile method. The shift in treatment philosophy from "extension for prevention" to "minimally invasive dentistry" has afforded the dentist the opportunity to diagnosis and manage caries at an early stage. An ideal caries detection method should capture the whole continuum of caries process, from the earliest to the cavitation stage. It should be accurate, precise, easy to apply, and useful for all surfaces of teeth, as well as for caries adjacent to restorations. 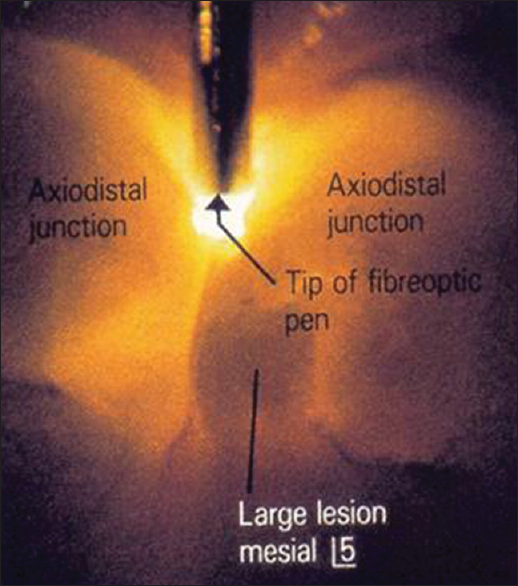 More technologically, advanced measures based on optical properties (fluorescence and transillumination) are the most potent methods for the detection of incipient carious lesions. Shafer WG. Textbook of Oral Pathology. 6 th ed. Bangalore: Prism Book Pvt. Ltd.; 1997. p. 409-45. Zandoná AF, Zero DT. Diagnostic tools for early caries detection. J Am Dent Assoc 2006;137:1675-84. Tranaeus S, Shi XQ, Lindgren LE, Trollsås K, Angmar-Månsson B. In vivo repeatability and reproducibility of the quantitative light-induced fluorescence method. Caries Res 2002;36:3-9. Angmar-Månsson B, ten Bosch JJ. 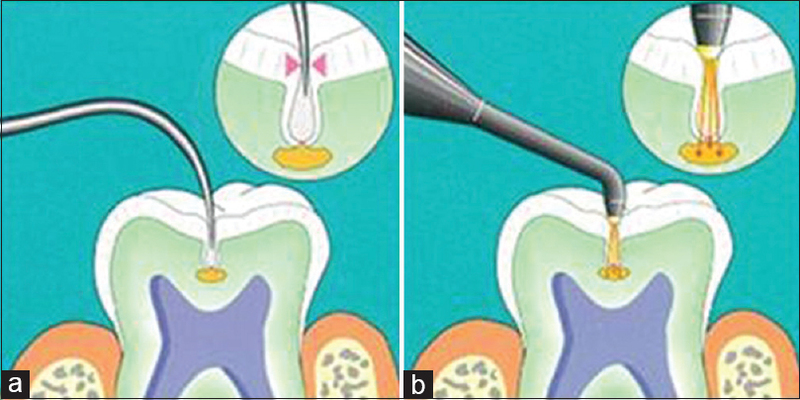 Advances in methods for diagnosing coronal caries - a review. Adv Dent Res 1993;7:70-9. Ludlow JB, Mol A. Oral Radiology: Principles and Interpretation: Digital Imaging. 5 th ed. Missouri: Mosby; 2004. p. 225-64. Yang J, Dutra V. Utility of radiology, laser fluorescence, and transillumination. Dent Clin North Am 2005;49:739-52. Stookey GK. 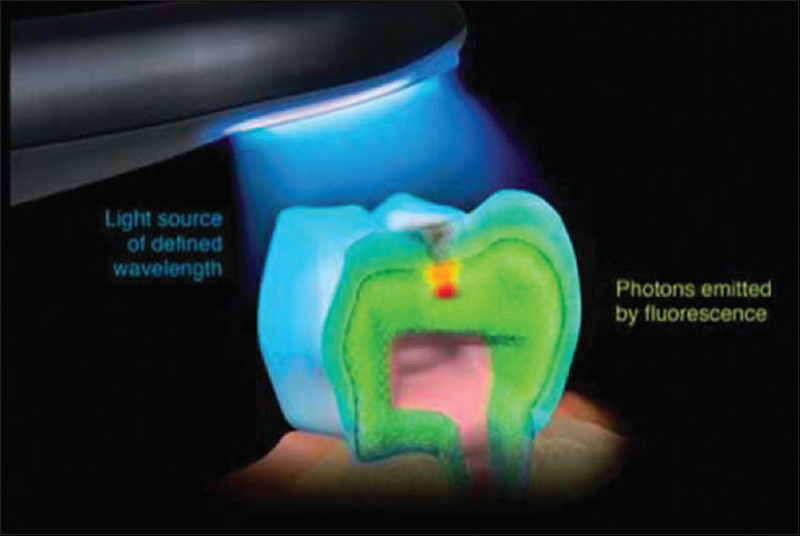 Quantitative light fluorescence: A technology for early monitoring of the caries process. Dent Clin North Am 2005;49:753-70, vi. Adeyemi AA, Jarad FD, Komarov GN, Pender N, Higham SM. Assessing caries removal by undergraduate dental students using quantitative light-induced fluorescence. J Dent Educ 2008;72:1318-23. Shi XQ, Welander U, Angmar-Månsson B. Occlusal caries detection with KaVo DIAGNOdent and radiography: An in vitro comparison. Caries Res 2000;34:151-8. Aleksejuniene J, Tranaeus S, Skudutyte-Rysstad R. DIAGNOdent - an adjunctive diagnostic method for caries diagnosis in epidemiology. Community Dent Health 2006;23:217-21. 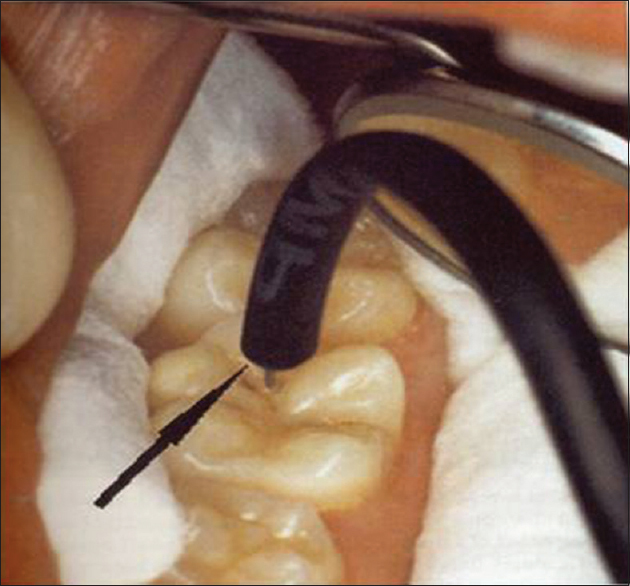 Kühnisch J, Bücher K, Hickel R. The intra/inter-examiner reproducibility of the new DIAGNOdent Pen on occlusal sites. J Dent 2007;35:509-12. Thylstrup A, Fejerskov O. Textbook of Cariology. 1 st ed. Denmark: Munksgaard; 1985. p. 16-27. Ashley PF, Blinkhorn AS, Davies RM. Occlusal caries diagnosis: An in vitro histological validation of the Electronic Caries Monitor (ECM) and other methods. J Dent 1998;26:83-8. Hall A, Girkin JM. 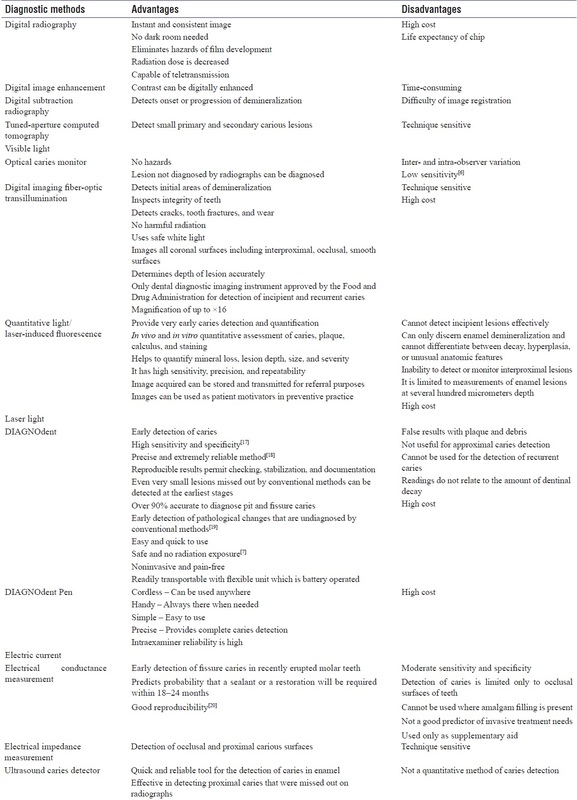 A review of potential new diagnostic modalities for carious lesions. J Dent Res 2004;83:C89-94. Olmez A, Tuna D, Oznurhan F. Clinical evaluation of diagnodent in detection of occlusal caries in children. J Clin Pediatr Dent 2006;30:287-91. Goel A, Chawla HS, Gauba K, Goyal A. Comparison of validity of DIAGNOdent with conventional methods for detection of occlusal caries in primary molars using the histological gold standard: An in vivo study. J Indian Soc Pedod Prev Dent 2009;27:227-34. Mendes FM, Siqueira WL, Mazzitelli JF, Pinheiro SL, Bengtson AL. Performance of DIAGNOdent for detection and quantification of smooth-surface caries in primary teeth. J Dent 2005;33:79-84. Huysmans MC, Kühnisch J, ten Bosch JJ. Reproducibility of electrical caries measurements: A technical problem? Caries Res 2005;39:403-10. Lin PY, Lyu HC, Hsu CY, Chang CS, Kao FJ. Imaging carious dental tissues with multiphoton fluorescence lifetime imaging microscopy. Biomed Opt Express 2010;2:149-58. Karlsson L. Caries detection methods based on changes in optical properties between healthy and carious tissue. Int J Dent 2010;2010:270729. Kaneko K, Matsuyama K, Nakashima K. Quantification of early carious lesions by using an infrared camera in vitro. In: Stookey GK, editor. Early Detection of Dental Caries II: Proceedings of the 4 th Annual Indiana Conference. Indianapolis: Indiana University School of Dentistry; 1999. p. 83-100. Matsuyama K, Nakashima S, Kaneko K. An in vitro study on the detection of early enamel carious lesions by use of an infrared camera. Caries Res 1998;32:294. Berry E, Fitzgerald AJ, Zinov'ev NN, Walker GC, Homer-Vanniasinkam S, Sudworth CD. Optical Properties of Tissue Measured Using Terahertz Pulsed Imaging. Proceedings of SPIE: Medical Imaging 2003: Physics of Medical Imaging; 2003. p. 459-70. Choo-Smith LP, Dong CC, Cleghorn B, Hewko M. Shedding new light on early caries detection. J Can Dent Assoc 2008;74:913-8. Ionita I. Diagnosis of tooth decay using polarized Micro-Raman confocal spectroscopy. Rom Rep Phys 2009;61:567-74. Jeon RJ, Han C, Mandelis A, Sanchez V, Abrams SH. Diagnosis of pit and fissure caries using frequency-domain infrared photothermal radiometry and modulated laser luminescence. Caries Res 2004;38:497-513. Jeon RJ, Matvienko A, Mandelis A, Abrams SH. 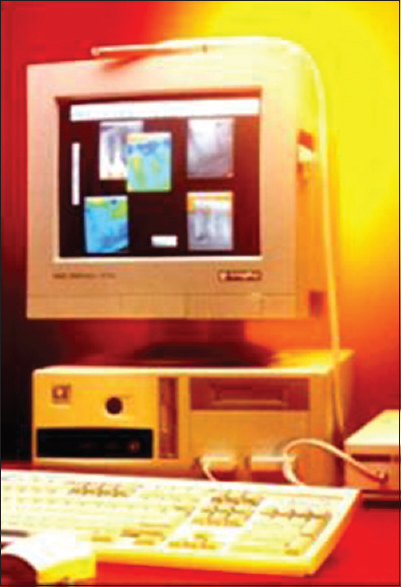 Interproximal dental caries detection using Photo Thermal Radiometry (PTR) and Modulated Luminescence (LUM). Eur Phys J Spec Top 2008;153:467-9.